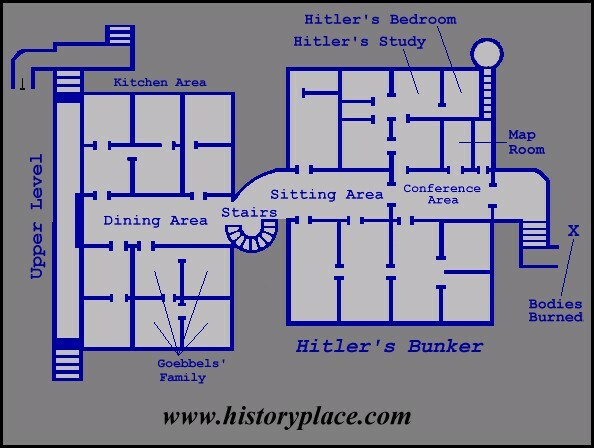 In April of 1945, Hitler moved into the Führerbunker, located 50 feet below the Chancellery buildings in Berlin. In this underground complex containing nearly thirty rooms on two separate floors, Hitler held daily briefings with his generals amid reports of the unstoppable Soviet advance into Berlin. He issued frantic orders to defend Berlin with armies that were already wiped out or were making a hasty retreat westward to surrender to the Americans. On April 22, during a three hour military conference in the bunker, Hitler let loose a hysterical, shrieking denunciation of the Army and the 'universal treason, corruption, lies and failures' of all those who had deserted him. The end had come, Hitler exclaimed, his Reich was a failure and now there was nothing left for him to do but stay in Berlin and fight to the very end. His staff attempted without success to convince him to escape to the mountains around Berchtesgaden and direct remaining troops and thus prolong the Reich. But Hitler told them his decision was final. He even insisted a public announcement be made. Propaganda Minister Joseph Goebbels then brought his entire family, including six young children, to live with Hitler in the bunker. Hitler began sorting through his own papers and selected documents to be burned. Personnel in the bunker were given permission by Hitler to leave. Most did leave and headed south for the area around Berchtesgaden via a convoy of trucks and planes. Only a handful of Hitler's personal staff remained, including his top aide Martin Bormann, the Goebbels family, SS and military aides, two of Hitler's secretaries, and longtime companion Eva Braun. On April 23, Hitler's friend and Minister of Armaments, Albert Speer, arrived for his final meeting with the Führer. At this meeting Speer bluntly informed Hitler that he had disobeyed the Führer's scorched earth policy and had preserved German factories and industry for the post-war period. Hitler listened in silence and had no particular reaction, much to the surprise of Speer. That afternoon, Hitler received a surprise telegram from Göring who had already reached safety in Berchtesgaden. In view of your decision to remain in the fortress of Berlin, do you agree that I take over at once the total leadership of the Reich, with full freedom of action at home and abroad as your deputy, in accordance with your decree of June 29, 1941? If no reply is received by 10 o'clock tonight, I shall take it for granted that you have lost your freedom of action, and shall consider the conditions of your decree as fulfilled, and shall act for the best interests of our country and our people. You know what I feel for you in this gravest hour of my life. Words fail me to express myself. May God protect you, and speed you quickly here in spite of all. An angry Hitler, prompted by Bormann, sent Göring a return message saying he had committed "high treason." Although the penalty for this was death, Göring was to be spared, due to his long years of service, if he would immediately resign all of his offices. Bormann then transmitted an order to the SS near Berchtesgaden to arrest Göring and his staff. Before dawn on April 25, Göring was locked up. The next day, April 26, Soviet artillery fire made the first direct hits on the Chancellery buildings and grounds directly above the Führerbunker. That evening, a small plane containing female test pilot Hanna Reitsch and Luftwaffe General Ritter von Greim landed in the street near the bunker following a daring flight in which Greim had been wounded in the foot by Soviet ground fire. Once inside the Führerbunker the wounded Greim was informed by Hitler he was to be Göring's successor, promoted to Field-Marshal in command of the Luftwaffe. Although a telegram could have accomplished this, Hitler had insisted Greim appear in person to receive his commission. But now, due to his wounded foot, Greim would be bedridden for three days in the bunker. On the night of April 27, Soviet bombardment of the Chancellery buildings reached its peak with numerous direct hits. Hitler sent frantic telegrams to Keitel demanding Berlin be relieved by (now non-existent) armies. The final blow came on the 28th when Hitler received word via Goebbels' Propaganda Ministry that British news services were reporting SS Reichsführer Heinrich Himmler had sought negotiations with the Allies and had even offered to surrender German armies in the west to Eisenhower. According to eyewitnesses in the bunker, Hitler "raged like a madman" with a ferocity never seen before. Himmler had been with Hitler since the beginning and had earned the nickname "der treue Heinrich" (faithful Heinrich) through years of fanatical, murderous service to his Führer, who now ordered Himmler's arrest. As an act of immediate revenge, Hitler ordered Himmler's personal representative in the bunker, SS Lt. Gen. Hermann Fegelein, who was also the husband of Eva Braun's sister, to be taken up to the Chancellery garden above the bunker and shot. Now, with the desertions of Göring and Himmler and the Soviets advancing deep into Berlin, Hitler began preparing for his own death. "I further left no one in doubt that this time not only would millions of children of Europe's Aryan people die of hunger, not only would millions of grown men suffer death, and not only hundreds of thousands of women and children be burnt and bombed to death in the towns, without the real criminal having to atone for this guilt, even if by more humane means." Just before midnight, he married Eva Braun in a brief civil ceremony. There was then a celebration of the marriage in his private suite. Champagne was brought out and those left in the bunker listened to Hitler reminisce about better days gone by. Hitler concluded, however, that death would be a release for him after the recent betrayal of his oldest friends and supporters. By the afternoon of April 29, Soviet ground forces were about a mile away from the Führerbunker. Inside the bunker the last news from the outside world told of the downfall and death of Mussolini, who had been captured by Italian partisans, executed, then hung upside down and thrown into the gutter. Hitler now readied himself for the end by first having his poison tested on his favorite dog, Blondi. He also handed poison capsules to his female secretaries while apologizing that he did not have better parting gifts to give them. The capsules were for them to use if the Soviets stormed the bunker. About 2:30 in the morning of April 30, Hitler came out of his private quarters into a dining area for a farewell with staff members. With glazed eyes, he shook hands in silence, then retired back into his quarters. Following Hitler's departure, those officers and staff members mulled over the significance of what they had just witnessed. The tremendous tension of preceding days seemed to suddenly evaporate with the realization that the end of Hitler was near. A lighthearted mood surfaced, followed by spontaneous displays of merry-making even including dancing. At noon, Hitler attended his last military situation conference and was told the Soviets were just a block away. At 2 p.m., Hitler sat down and had his last meal, a vegetarian lunch. His chauffeur was then ordered to deliver 200 liters of gasoline to the Chancellery garden. Hitler and his wife Eva then bid a final farewell to Bormann, Goebbels, Generals Krebs and Burgdorf, other remaining military aides and staff members. Hitler and his wife then went back into their private quarters while Bormann and Goebbels remained quietly nearby. Several moments later a gunshot was heard. After waiting a few moments, at 3:30 p.m., Bormann and Goebbels entered and found the body of Hitler sprawled on the sofa, dripping with blood from a gunshot to his right temple. Eva Braun had died from swallowing poison. As Soviet shells exploded nearby, the bodies were carried up to the Chancellery garden, doused with gasoline and burned while Bormann and Goebbels stood by and gave a final Nazi salute. Over the next three hours the bodies were repeatedly doused with gasoline. The charred remains were then swept into a canvas, placed into a shell crater and buried. Back inside the bunker, with the Führer now gone, everyone began smoking, a practice Hitler had generally forbidden in his presence. They next began collectively plotting daring (but fruitless) escapes out of Berlin to avoid capture by the Soviets. On the following day, May 1, Goebbels and his wife proceeded to poison their six young children in the bunker, then went up into the Chancellery garden where they were shot in the back of the head at their request by an SS man. Their bodies were then burned, but were only partially destroyed and were not buried. Their macabre remains were discovered by the Soviets the next day and filmed, the charred body of Goebbels becoming an often seen image symbolizing of the legacy of Hitler's Reich. My paintings, in the collections which I have bought in the course of years, have never been collected for private purposes, but only for the extension of a gallery in my home town of Linz on Donau. He is given full legal authority to make all decisions. He is permitted to take out everything that has a sentimental value or is necessary for the maintenance of a modest simple life, for my brothers and sisters, also above all for the mother of my wife and my faithful co-workers who are well known to him, principally my old Secretaries Frau Winter etc. who have for many years aided me by their work. After six years of war, which in spite of all setbacks, will go down one day in history as the most glorious and valiant demonstration of a nation's life purpose, I cannot forsake the city which is the capital of this Reich. As our forces are too small to make any further stand against the enemy attack at this place and since our resistance is gradually being weakened by men who are as deluded as they are lacking in initiative, I should like, by remaining in this town, to share my fate with those, the millions of others, who have also taken upon themselves to do so. Moreover I do not wish to fall into the hands of an enemy who requires a new spectacle organized by the Jews for the amusement of their hysterical masses. I die with a joyful heart, aware of the immeasurable deeds and achievements of our soldiers at the front, our women at home, the achievements of our farmers and workers and the work, unique in history, of our youth who bear my name. May it, at some future time, become part of the code of honor of German Army officers - as is already the case in our Navy - that the surrender of a district or of a town is impossible, and that above all commanders must march ahead as shining examples, faithfully fulfilling their duty unto death. Before my death I expel the former Reichsführer-SS and Minister of the Interior, Heinrich Himmler, from the party and from all offices of State. In his stead I appoint Gauleiter Karl Hanke as Reichsführer-SS and Chief of the German Police, and Gauleiter Paul Giesler as Reich Minister of the Interior. Göring and Himmler, quite apart from their disloyalty to my person, have done immeasurable harm to the country and the whole nation by secret negotiations with the enemy, which they have conducted without my knowledge and against my wishes, and by illegally attempting to seize power in the State for themselves...[Hitler then names the members of the new government].